Washdown Step Motors are conventional hybrid step motors which are dust proof and resistant to low pressure water jets. They are ideal for applications in wet factory environments such as the food and beverage industry or outdoor use. Key features include a nickel-plated brass cable gland, sealed laminations, a front shaft contact seal and an optional IP65 rated encoder cover for use with products that require feedback. 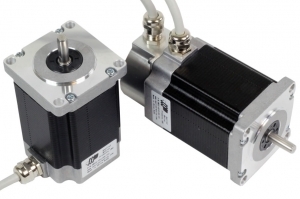 Applied Motion Products' family of washdown stepper motors, the HW23, HW24 and HW34 Series, includes the addition of NEMA size 23, 24 and 34 stepper motors with IP65 ratings for operation in severe environmental conditions. All models have an internal corrosion-resistant film coating as standard. For improved protection in high-humidity environments an advanced coating is available as an option.